New model of the famous Bananaa jet. FSDS2 mouving: wings, gear, suspensions, canopy, hook and spoiler . FSDS2 Model and texture by Giovanni Clemente. Repaint by Giovanni Clemente and Paul Heaton. Twin engine tandem seat low level strike attack aircraft powered by two Rolls Royce Spey non-afterburning bypass turbofans developing 12600 lb. static thrust each. “On account of rapidly improving air defense systems, the requirement for attack aircraft to be able to penetrate deep into enemy territory involved the aircraft coming very low, underneath the radar, thus leaving no chance for interception until it is too late. This option demands aircraft of great strength, for turbulence is acute at very low levels, and advanced avionics, with forward, downward and sideways looking radar hooked into a computer which can fly the aircraft round or over obstacles in its path much more surely than a pilot can. The very rigid structure of the Buccaneer proved ideal for the task. A windless evening, a good weather forecast for the entire east of the country. The CO rubs his hands and smiles. My heart sinks. It’s St Lucia again. My ingrown Natal boyhood mentality rears it’s head once more. I know it is an impossibly perfect weapons range, but my boyhood visits to Hluhluwe, Umfolozi and all the adjacent reserves have made me, if not an expert, a devotee of nature conservation. The thought of heavy jet aircraft roaring around at night, dropping little practice bombs into the pristine lake doesn’t thrill me. However, a night weapons sortie is always attention grabbing, and believe it or not, is important. There is work to be done. As Flight Commander I confer with the ground crew and allocate aircraft, crews and practice weapon loads, while our navigators cluster over their maps and radar diagrams. The CO is not flying tonight. We, just lowly pilots, work out the details of the attacks to be practised. Then we brief. As it is to be a clear night it would be silly not to include some night air to air refuelling in the exercise. I like the ease of bombing at St Lucia because it is so ideal and relatively close to Pretoria. Just 190 miles as opposed to the long slog to Upington or the Western Cape coast, and there is the facility of control and marking from the missile boffins who reside there… but I hate being there in a noisy great Buccaneer over a wonder of nature, as beautiful as it might look from the air. I would much rather be snuggled up in a sleeping bag with a girl who is close to my heart, right there, looking at the stars and enjoying the silence. I sometimes wonder! But, we have a job to do and we get down (or rather, up!) to it. We go through the mechanics of joining up and climbing away en route. Our buddy fuel carrier is with us, so there is no rendezvous problem. As we enter Northern Natal and Zululand, we cuddle up to him and take on the fuel required to complete the mission. He peels away and goes home, job done. We go down to low level to play our game of soldiers. Out to sea for about one hundred miles then a turn about for a dash in to the coast to simulate an attack before pulling into the pattern for our practice bombing on the radar target off the inlet to False Bay at Lake St Lucia. With the details of the ‘play’ attack over we join the range in order. The guys in the camp on the ground give us our clearance over the radio and we get to work. It is a clear calm night and the visibility is quite good. We space for the attacks and keep a good lookout for each other. A mid air collision is not desirable. A steady ten to twelve mile run in is required, culminating in a pull up at three miles to toss our little bombs at the small radar returning platform moored in the lake. We are not using flares tonight, they are very expensive, and we make exclusive use of our attack radar. The stillness of the night causes another problem. As the surface of the lake is so calm our radio altimeter emanations are not returned by the water surface of the lake. The beams go straight through the water to the lake bed giving us a false return of our height. As we are doing our runs at two hundred feet this can deceive us as to our actual height, which could be a bit fraught! We do have a setting to alleviate this, but with an attack speed in the order of 480 knots there is not time to play around. During the early 1950s, the Soviet Navy underwent a major fleet expansion to challenge US and NATO naval supremacy, posing a serious threat with their new of SVERDLOSK-class cruisers. In response, the British Royal Navy decided to obtain a low-level carrier based attack aircraft. This aircraft was intended to penetrate the defenses of Soviet naval battle groups by streaking in at low level and high speed, then destroy them with a nuclear weapon in a “toss-bombing” attack. The requirement was formalized as “Naval Staff Requirement Number 39 (NA.39)” in June 1952, which called for a two-seat carrier-based aircraft that could carry a nuclear weapon internally, fly at a speed of Mach 0.85 at an altitude of 60 meters (200 feet), and operate over a combat radius of at least 740 kilometers (460 miles). Total weapons load was to be 1.8 tonnes (4,000 pounds); the length could be no more than 15.5 meters (51 feet) in stowed configuration to allow accommodation on existing carrier-deck elevators; and the maximum weight was to be no more than 20.4 tonnes (45,000 pounds). The aircraft was to have the capability of acting as a tanker. At the time, Blackburn was building nothing more warlike than transport and cargo aircraft. Nonetheless, the company responded to the requirement with a design with the company designation “B.103”, which incorporated a number of advanced features. The requirements for aircraft payload and performance dictated twin engines. Blackburn originally considered the Armstrong Siddeley “Sapphire Sa.7” engine with 4,990 kilograms (11,000 pounds) thrust, but it proved too bulky and heavy. As an alternative, de Havilland proposed a scaled-down version of their Gyron turbojet, the “PS.43 Gyron Junior”, to be known in production as the Bristol Siddeley “Gyron Junior Mark 101”. The Gyron Junior was a non-afterburning engine that offered 3,630 kilograms (8,000 pounds) of thrust. Low-level flight demands an aircraft with small wings and high wing loading to reduce bumpiness from gusts and turbulence, but carrier takeoff and landing generally demands large wings and low wing loading to ensure short takeoff, and slow landing speeds. Blackburn compromised by using a small wing that incorporated a “flap blowing” or “boundary layer control (BLC)” system. The BLC system used a network of ducts that bled ten percent of the engine compressor flow and routed it to the leading edges of the wings and over the flaps and ailerons. It also directed engine bleed air to the underside of the high-set “tee” tail. The BLC system almost doubled lift at low airspeed, and also provided an effective de-icing system. The B.103 was designed to be fitted with two stores pylons under each wing, for a total of four, but also had a bomb bay, which was to accommodate four 450 kilogram (1,000 pound) bombs or a single nuclear weapon. A conventional bomb bay was not regarded as suitable for high-speed low-level attack, and so the B.103 was given a rotating bomb bay door, with munitions attached to the door itself. The door could snap around rapidly, reducing aerodynamic difficulties. The rotating bomb bay not only simplified weapons release, but made it easier to load munitions and perform servicing. The bomb bay could also in principle accommodate a reconnaissance camera pack; a 2,000 liter (528 US gallon) ferry fuel tank; a cargo container; or a pack with twin Aden 30 millimeter cannon. However, although the other items were built, the cannon pack was not, and the aircraft would never incorporate gun armament. The cargo container would prove useful for transporting golf clubs and other essentials. Total internal fuel capacity was 7,092 liters (1,871 US gallons). This fuel load was augmented by two underwing “slipper” tanks that were mounted over the inboard stores pylons and had a capacity of 1,136 liters (300 US gallons), as well as the ferry tank mentioned above. The B.103 incorporated the new “area rule” aerodynamics, where abrupt changes in the cross-sectional area of the aircraft, including the wing, were to be avoided. This allows the fuselage to expand aft of the wing and results in a “coke bottle” appearance. Blackburn engineers used area-ruling to improve the design’s aerodynamics, while also increasing the storage capacity of the aircraft’s fuselage, giving the aircraft a distinctive set of full-bodied curves. The airframe was designed with an emphasis on strength, and the aircraft would generally be described as being “built like a brick outhouse”. The aircraft met the carrier-deck elevator dimension limits through a number of features. Its wings folded straight up from about half-span through 120 degrees, and its nose cone could be pivoted back to allow access to its radar and reduce length. The tail cone was split and could be hydraulically opened to act as a variable air brake and also reduce length. All these features allowed the B.103 to fit neatly on an elevator and in the hangar deck. * The design was frozen by the summer of 1954. The British Admiralty selected the B.103 in July 1955 and placed an order for 20 developmental aircraft. This was an unusually high number of pre-production aircraft, but the Royal Navy was in a hurry and wanted to ensure that loss of a prototype would not delay the program, and also wanted to pursue development of various subsystems in parallel. Development work on the B.103 proceeded in deep secrecy. The Admiralty requested that a prototype be flying by April 1958, and the first prototype managed to take to the air on 30 April. Successive prototype production gradually incorporated features for operational aircraft. Carrier trials began in early 1960, having been delayed several months by the stall and crash of one of the prototypes, with both crew members killed after ejecting from their inverted aircraft. On 20 August 1960, the new aircraft was given its official name: “Buccaneer”. The initial version was designated “S Mark 1 (S.1)”, with the “S” indicating that it was a strike aircraft. All 20 developmental aircraft had flown by the end of 1961, though there were further losses of prototypes. One went down in October 1960 due to a flight instrumentation failure, the two crewmen ejecting safely. Another was lost in August 1961 on takeoff during carrier trials, with both crewmen drowning because they were unable to escape from the aircraft. Nonetheless, the flight test program otherwise went well, and the first Buccaneers were delivered to the Royal Navy in August 1961. Number 801 squadron became the first operational Buccaneer unit in July 1962, with operational cruises beginning in 1963. Ground-based Buccaneers operated out of a number of naval air stations, but the Buccaneer would be particularly associated with the naval air station at Lossiemouth, on the northeast coast of Scotland. Early in development, the B.103 was assigned the designation “ARNA”, for “A Royal Navy Aircraft”. This acronym became reinterpreted as “Banana”, and the Buccaneer would from then on be nicknamed “Banana Jet”. The press liked to call it the “Brick”, to the annoyance of Buccaneer crews. The Buccaneer FSDS2 has a good main panel. There is also a very good virtual cabin with good side views. There is also very good movement files. For example the turbines have excellent movement effects. Aswell the wheels have rotating movement. In the main panel, the gauges arevery well detailed. 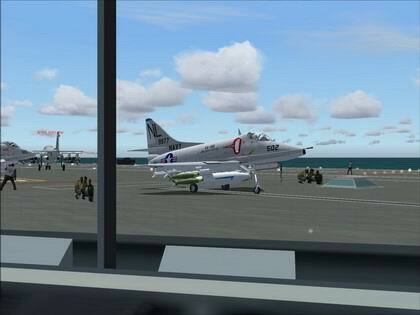 In the outside views there are two 3D pilots, piloting the aircraft, very well done. I will advise the author Giovanni that he could have included some head movement, but without that it is still a very good aircraft. But after all a very good plane with excellent textures.